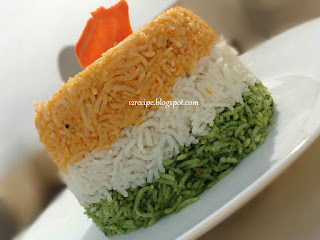 Ribbon rice consist of different layers of rice with different flavors and colors. You can also add any meat or veg filling in between them or simply the rice itself. Wash and soak basmati rice in water for 30 minutes. Drain it and keep aside. Heat a pan with ghee, add whole spices and drained basmati rice. Saute for about 5 minutes in low flame until the rice gets dried but not changed its color. Add salt and 3 3/4 cup of boiling water in to it. Cover cooks it for few minutes until all the water gets absorbed and the rice gets cooked nicely (stir two to three times at the last stage of cooking). Heat butter in a pan, saute grated carrots for three minutes. Add little salt, pepper powder and switch off the flame. After cools down make a fine puree out of it (without adding water). In the same way heat a tsp of butter in a pan, add chopped palak and saute for a minute. (no need to to add salt , if necessary add only a pinch). After cools down make a puree out of it (without adding water). Now divide the rice in to three equal parts. Mix one part with carrot puree and heat for a minute to mix well. Mix another one part with palak puree and heat for a minute o mix well. And the third one remains in the same white color. 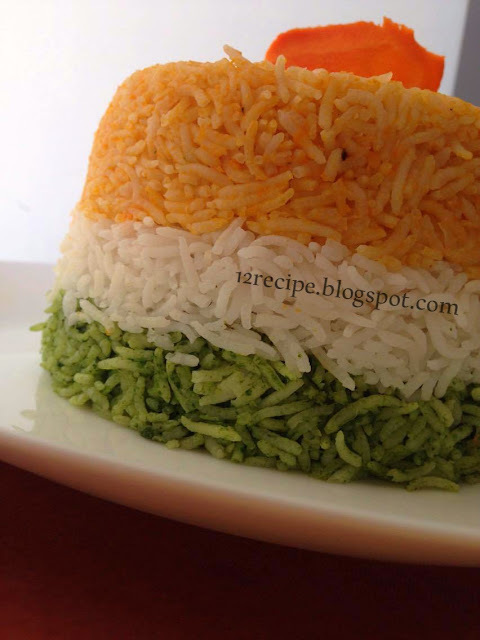 Take a wide bowl, add the carrot rice at its 1/3 level and pack it thickly. Then top it with white rice and then palak rice. Invert the bowl in to a serving dish and serve in accompany with pickle, raitha or curry. this is looking like a delicious recipe I have never tried it yet and those colors my kids gonna love it.